I hope you got to see Tiger play in the US Open, and then hear afterwords how his knee was much worse than any of us thought at the time… It wasn’t just “a little sore” from surgery a few weeks prior — he was playing with a fractured tibia and a torn ACL. Rocco vs. Tiger was great to watch, but what we saw in Tiger was perhaps the most mentally tough person in all of sports history. Before Tiger, I probably would have said Lance Armstrong was the most mentally tough. Lance was also amazingly tough in other ways — who comes back from cancer that bad to be the best athlete in the world at their given sport? Lance always impressed me as he was up for almost every big ride. I only saw him lose it once in 7 years of watching — and yes, I watched almost every TDF ride… But even more than that, the little things always impressed me with him. He was a master strategist in all the races, especially the big ones. But most of, he was always concentrating — never letting anything get by him. The number of times there was a crash all around him and he came out unscathed was amazing — and that only comes from paying attention. But, back to Tiger… I have never seen anyone so mentally tough — able to will up the most incredible shots when most needed. And then to see him fight through pain to play good enough to win. I know a little about knee pain — when my knee got so bad that I fell to the ground trying to start a lawn mower, or later that day when I lifted my leg to see what was hurting, and again fell down in excruciating pain. No one other than Tiger knows how bad his pain was. But what was most amazing to me, was that he never knew when it was going to hit. He’d line up for a shot, and not know if sometime during the shot, or on the follow through, the knee was going to hurt. Yet he did it time after time after time. 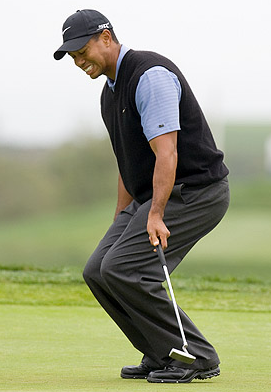 I was truly amazed by Tiger’s tenacity in this US Open. I was already a fan, but I became a fanatic. Now to realize the extent of pain he was in only solidifies my feelings: I really, really cannot help but like that guy!